Big W Lights for 2012 have appeared. Discussion in 'Christmas Light Shopping Bargains' started by aussiexmas, Sep 22, 2012. Just visited my local Big W and found some lights on the shelves. They are in different boxes this year, but are available in 200 count starter pack strings @ $20 and 100 count extensions at $12, - similar pack sizes and pricings to last year. Colours on the shelves were white, blue, red, pink and multi, (didn't see green). Note - no warm or cool whites, just white. I bought a pack of white to compare to previous years and they are somewhere between the previous year's warm and cool white - do NOT match either of the previous colours. The bulb covers (lenses) are also clear this year instead of frosted as in previous years. I have not checked voltages or currents yet. I was just about to say the same thing. My local Big W had empty shelves, but the price tags were there as were the shelf maps. I asked at the service desk and they said the shelves would be full by next weekend. I saw the canberra / woden store had the shelves clear, with a map of what goes where pinned to it yesterday. Looking forward to the lights hitting the shelves! 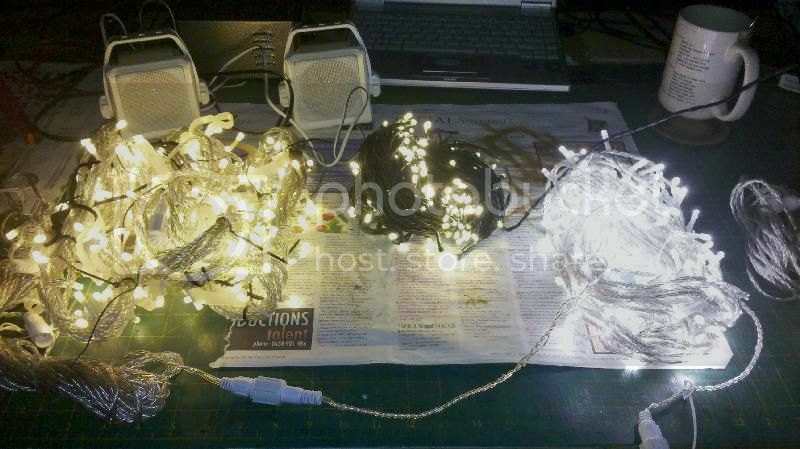 Yesterday, I purchased 1 string of the new Big W white LEDs to compare to previous years. My initial impression was that they were less bright this year, and somewhere between the cool and warm whites of previous years. The attached comparison photo was made using their as supplied transformers. Some quick voltage / current measurements confirmed that the 2012 string drew a lower current than previous years. At 30V, the 2012 currents were 3-4mA/bulb (~ 75mA for the 20 circuit/ 200 bulb string) compared to 7-8mA/bulb for the 2011 cool and warm whites, (~150mA/string). To achieve an equivalent current & brightness for the 2012 white string, a string voltage of ~ 33V is required. The packaging looks like it'd cost more than the old boxes! I don't mind the new white, it is a pretty close white, but as you say won't match any of the old white! Spot anything new in this year's range, or is it the same old? Are rope lights still 240v or now low voltage? The longer strings have even bigger boxes than the 200 starter sets. Extensions and other light forms are in soft plastic as was case last year. No ropelight on shelves yet. Seems that only the whites (strings & icicles) have clear bulbs, coloureds are frosted. At my store, there are still a lot of vacant shelves, but the items on display are similar to previous years. The new white is certainly cleaner looking than the cool white which looks quite blue by comparison now! No sign of Christmas lights on the online store yet. Strathpine had what looks like half the shelves stocked this afternoon. 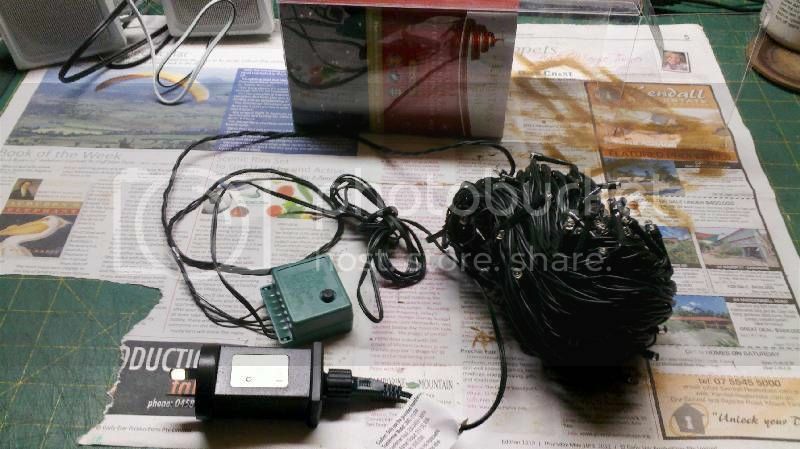 All the ropelight stuff is 240V still, although there was some solar power ropelight stuff too. The new bucket containers are a great bonus too! Thanks for the update AussieXmas, and the comparison pictures. I noticed that the rope light from Deals Direct is 24v if that helps. Stock in stores very soon! I picked up 10 starter kits from Big W at Garden City in Brisbane. I didn't even dent their stock levels and they were still loading the shelves. I had a look at the planogram for the Underwood BigW and didn't see any green - shelves looked fully(or nearly) stocked. Bought a set of white, red, pink(box says pink, planogram says purple) and blue which seems to be their full range this year in the 200ct sets in the tubs so I can compare with last years. Ran through the packs of lights I bought today and compared to last years. No current measurements, visual only, connected lights up at 30V DC and using standard transformer(same details as last year). 2012 red and blue 200ct are same as 2011. 2012 pink 200ct is same as 2011 purple. Geoff has covered the difference between 2011 cool and warm white and this years white 200ct, but I also noted a pack of warm white 160ct for $10. The 160ct warm white uses green coloured wire and a different transformer. The only connector is a 2-pin thing that plugs into the transformer, completely incompatible with last years connectors. The LED is clear, not frosted as last years. Transformer claims 31V DC output. For comparison, from left to right, 2011 Warm White on 30V DC, 2012 Warm white using supplied transformer and 2012 White on 30V DC. Apologies for the photo quality, but you should see some resemblance with last years warm white, but not a match.